Tag Archive | "running usa"
Running USA released their Half Marathon Report for 2011 yesterday. I was looking at it and comparing it to the Marathon Report for 2011 they released last month. I am a numbers geek and I like to look at all the data in the reports (median ages, median times, fastest times, slowest times, biggest, etc. ) Ok, I confess…I do compare my times to the median times to see how I compare to the rest of the runners out there. Is that bad? But on a less selfish note, our sport is really growing and that is really awesome to see. 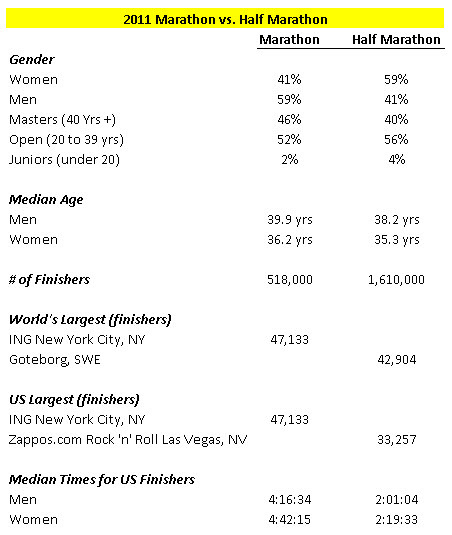 Kind of interesting to see the percentages for men & women flip for the marathon vs. the half marathon, don’t you think? And also that the median ages increase slightly as the distance goes up?